Tunics There are 57 products. 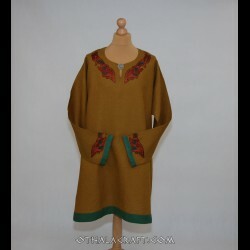 Simple T-tunic made of hand made 100 % woolen fabric in diamond pattern. This wool is thicker. 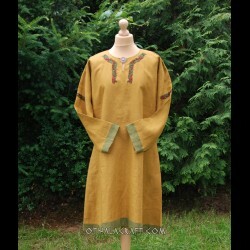 Decorated Viking tunic made of brown linen fabric (100%). Shape based on a find from Birka (Sweden), 8th-9th cent. Simple T-tunic made of dark blue linen fabric (100%). Made of two rectangles and with square-shaped wedges under the armpits and split at the sides. 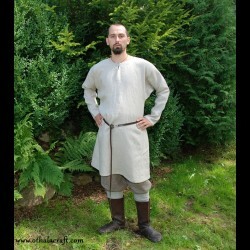 Decorated Viking tunic made of 100% linen fabric. Shape based on a find from Birka (Sweden), 8th-9th cent. Decorated Viking tunic made of dark blue linen. Shape based on a find from Birka (Sweden), 8th-9th cent. Decorated Viking shirt made of blue linen 100%. Shape based on a find from Skjoldehamn, Northern Norway. 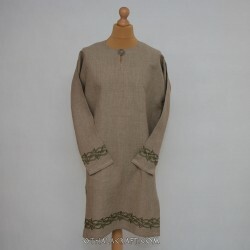 Decorated Viking tunic made of 100%, linen in khaki color. Decorated Viking tunic made of 100%, linen in blue color.